Thanks to an anonymous donor, we have awesome awareness t-shirts available! These super soft gray t-shirts say, on the front, My shirt saves lives. Marfan.org. 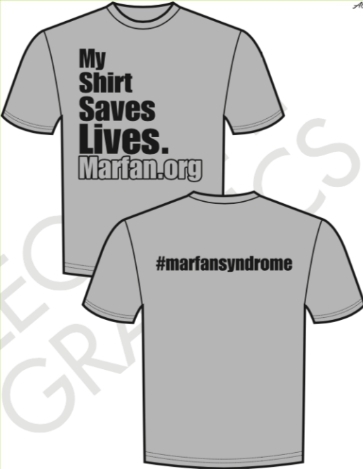 The back says #marfansyndrome. The cost is only $25 per shirt for US shipments and $35 per shirt for shipments outside the US. Limited quantities are available so please place your order today! All sales are final.